Northern Tablelands MP Adam Marshall pictured today with Guyra Central School student Hunter Davidson, winner of a 2016 Premier’s ANZAC Memorial Scholarship. 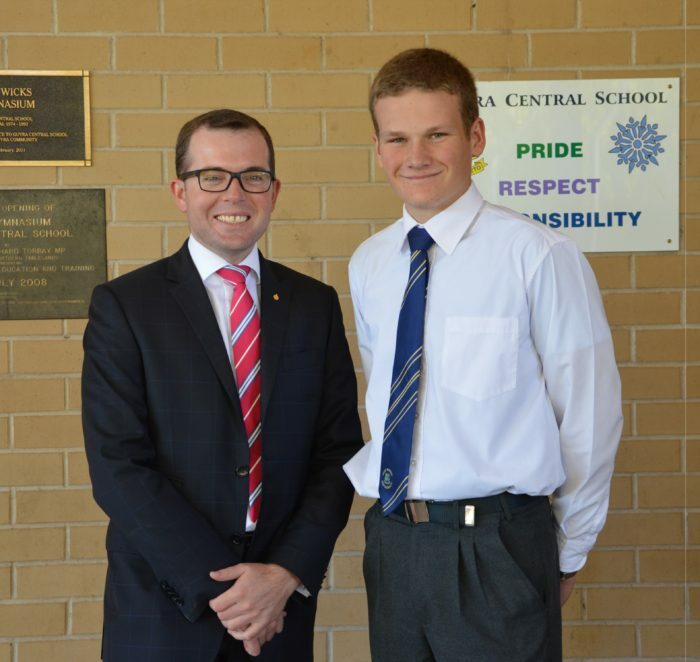 MEMBER for Northern Tablelands Adam Marshall today met and congratulated Guyra Central School student Hunter Davidson who will be one of 24 outstanding Year 10 and 11 students that will travel to the battlefields and memorial sites of the Western Front later this year as winners of the 2016 Premier’s ANZAC Memorial Scholarship. Mr Marshall said the Year 11 student and his 23 fellow scholars would travel to France in July and visit the official commemorations of the Battle of Pozières and the Battle of Fromelles, which were the setting for displays of great sacrifice by the ANZACS. “We’ve recently marked the centenary of the first landing of Australian troops in France as they made their journey to fight in the harrowing three year stalemate on the Western Front,” Mr Marshall said. Mr Marshall said that that the school and local community was extremely proud of Hunter. “It was thrilled to announce Hunter’s success in front of the entire school community today and I know it was a proud moment for his father Shane, who was also present,” he said. “To win this scholarship is an incredible achievement for Hunter, who is a bright and hardworking student with a keen interest in Australian history, particularly our nation’s involvement in World War I. “This is a fantastic opportunity for Hunter to represent Guyra in the once-in-a-lifetime Centenary of ANZAC commemorations. The 24 students will be accompanied by three supervising teachers, a tour historian and NSW Returned Services League (RSL) representatives. Hunter will be joined on the trip by another scholarship recipient from Warialda High School, Year 10 student Jim Skinner.